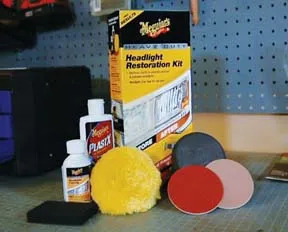 Meguiar’s Heavy Duty Headlight Restoration Kit is designed to return heavy oxidized headlight lenses to like-new condition. Lightly sand with the two different grades of fine sandpaper and water, following with the Meguiar’s PlastX Clear Plastic Cleaner & Polish. Apply the PlastX to the wool buff pad using a standard corded drill to polish the plastic. Work for 1-2 minutes wiping off the residue before it dries, then repeat this process if needed until the lenses look like new. Clean with a glass cleaner and apply a medium coat of the included Headlight Coating. Allow to cure and apply a second coat for a thorough seal.